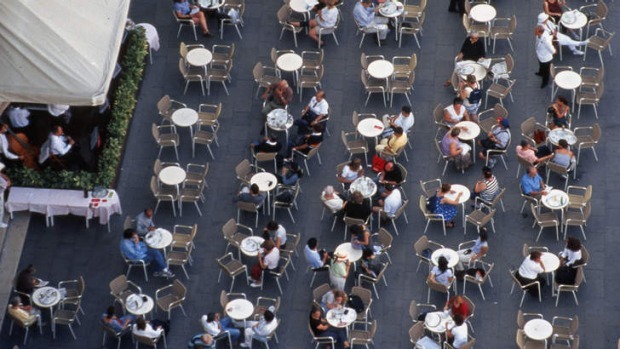 In Italy, heading out for coffee is "we" time, not "me" time. "La vita e gia amara. Almeno metti lo zucchero al caffe." So says an old Italian friend from Abruzzo: "Life is bitter enough. At least put sugar in your coffee." For palates used to third-wave coffee in Sydney and Melbourne - with the emphasis on roasting light to bring out the fruity and acidic flavours of specialty-grade beans - bitter is certainly the word on a coffee pilgrimage to Italy, the spiritual home of espresso. The roasts are darker, and the coffee sometimes a blend of arabica and robusta beans (especially in the south), with the resulting brews quite bitter, even in comparison to Italian-style roasts in Australia, which now use almost exclusively arabica beans. By tradition, Australian coffee pilgrims make a beeline for the bar in the arrivals hall at Rome's Fiumicino airport for their first taste on terra sancta. The airport bar works on the classic Italian system: pay the cashier, take the receipt to the barista and call out your order (don't just wait for him to make coffee and hand it to you - he won't). The result is a cup that looks smaller than at home, with a shot of dark, viscous liquid in the bottom and a nice pale crema. Without sugar it's unpleasantly bitter: tip a sachet in and stir. Then it will be delicious in that Italian way. You find the big, familiar brands - Lavazza, Illy, Romcaffe - in most parts of the country but there are hundreds of roasters in Italy (one recent estimate put the number at more than 600) and chances are you'll be drinking something you've never heard of. Even in a small town there's a choice of bars with coffee from different roasters: if you don't like one, try the next. The point is that the coffee isn't the point: it's a means to an end. While we have made an artform of fetishising coffee in our New World way - mea culpa - coffee in Italy is part of the discourse that sustains community. To get this, front up to a bar in a small town early in the morning. A procession of locals comes in, ordering caffe or cappuccino or caffe macchiato, and exchanging a few words with the barista and each other as they stand around in the small space. It's not just "me" time, it's "we" time: a little drop of social lubrication that helps keep the wheels turning. That, in itself, is sweet enough.